Alright, Guys! We’re going to talk about the 3 Key Points from Building Systems to Get What You Want. The first one is The Systems Lightbulb. If we think about the business as primary system, this primary system is one holistic big system, which is made up of lots of other sub-systems, which in them sub-systems they have series of processes and procedures. If we understand all of the procedures in a system can be tweaked, one by one collectively that improves the primary system. There’s no one big fix for a problem in the business. It’s no one big launch strategy that would just fix everything. It does not exist. It’s fixing one by one systems and processes which build the results of the primary system. The only difference between a huge business, a big successful one, ever worked in a corporation, it was all processes and procedures and that’s the only difference between a startup and a big business – it’s procedures. I think that is overlooked a lot. If you’ve read any of Michael Gerber’s work, at e-Myths, he talks a lot about building a business as if it was already complete. Thinking about envisioning your business and have a map or operate it as if it was a huge corporation. Have that mindset and operate it as it really was and grow towards that. So, what I want with this point today is to enable you to get it. Remove the emotion, take a bird’s eye view of your business, see the primary system of your business and the primary system of your personal life and see all the collection of systems which make it up. We talked about this before in terms of creating a wheel of life. For instance, for your personal life the categories in your life like your health, your finances, your relationships or any other area in your life which you care about, your spirituality – these would be sub-systems of your primary system of your personal life. The same can be applied to the business. So, if we talk about systems in the Amazon Model, things like your product launch system, your asset builder launch system, your asset optimization system, your Amazon apps, your customer love system, all these are different sub-systems of the primary system in the business. If we look at our lives like that it’s going to make so much easier to be able to tweak the systems of our personal lives to get the results that we want in our personal lives and the business. The second key point is Defining the Map. If we are now clear on the idea that our lives are made up of thousands of systems and our business is a collection of primary systems and a bunch of sub-systems underneath it and our personal life as well. If we can just find our map by basically getting it on the table, defining all the sub-systems in our business, all the things which make up the primary system and define all of the processes of the sub-systems it becomes a complete overview of the Amazon e-commerce business that you have. Once you’ve got that it becomes a lot clearer, a lot easier to be able to put on your tool belt, identify the constraints, identify where in this map of processes the problems are, put your tool belt on, fix it, improve the procedure, hand it to a team member so they understand it and fix the bottleneck so more output can happen through the sub-system. The third key point is Understanding What the Goal is. The Goal is to secure the present and the future of the company – the over action goal. So how do you do that? How do you secure the present and future of your company? You need to provide employees of a secure and satisfied workplace to make sure they are happy and aligned. You need to make sure that your customers are satisfied now and in the future and you are making money and profit for the shareholders or owners of the company. If you think about making money, satisfying customers, satisfied employees that secures the future of and the present of the business. If you just focus on them, I think if you, and everyone on your team, got aligned on what the outcome is, what their goal is, then it’s going to make a lot of your actions a lot black and white on what you need to do to make the changes to get the outcome that you want. P.S. When you are ready, there are 4 more ways we can help you. 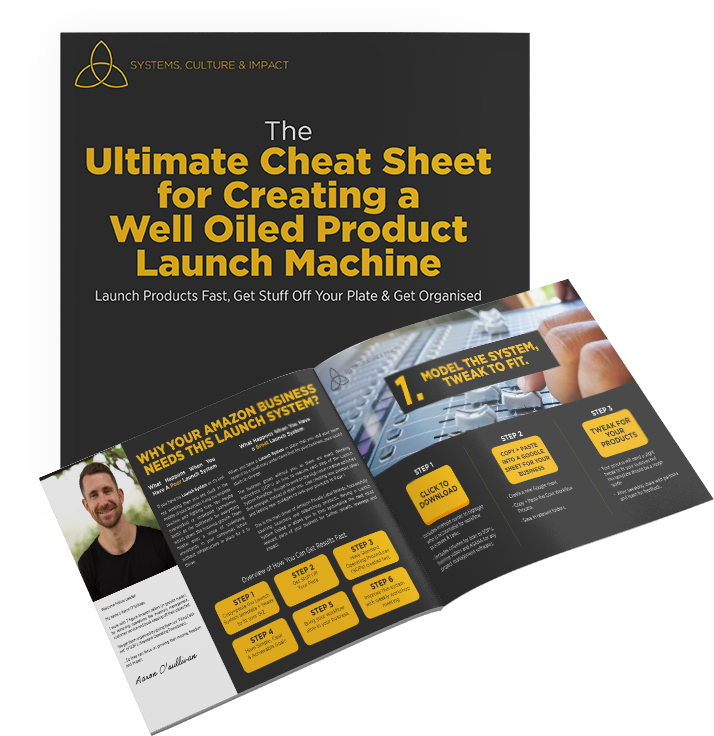 Get access to ‘The Ultimate Cheat Sheet for Creating a Well Oiled Product Launch Machine.’ It shows you how to launch products fast, get stuff off your plate & get organised. It’s FREE and you can grab it HERE. Join our Group – ‘Email Marketing for Amazon & eCommerce’. It’s our community where biz owners learn to get stuff off their plates, get organised and unlock cash flow in their email lists while building a real relationship with their audience. If you’re looking for a Rockstar Graphic Designer who can totally revamp your product images digitally, we can help. He’s been with us 4 years and is incredible at creating powerful images that grab attention in the Amazon search results…to convert more lookers to paying customers…helping you build momentum, improve rankings and grow profits…Don’t take our word for it. Click here to see what others are saying. Apply for our ‘Done For You’ Email Marketing Agency. I’m working closely with 7/8 figure brands to and turn their email lists into thriving profit centres by driving sales on and off Amazon. We’re driving page 1 rankings, 5 star reviews and long term value of your customers…Without this being an additional expense. (Pay As You Profit). If you’d like to work privately with me to unlock cash flow stuck in your email list while building a real relationship with your audience, then just comment “Done For Me”.